"I only have good things to say about Rochelle and Judy! They have made my life so much easier at work and have already referred them to other companies. They really know their stuff and I have high expectations and they always deliver! I also really appreciate how responsive hey are. You really can't go wrong with Yield!" "Our small architecture firm started working with Rochelle with a few months ago--it's honestly one of the best decisions we've made in our almost 14 years in business. In a matter of months, she's significantly eased my workload and stress. She quickly understood where I needed help, as well as made additional suggestions that eased my burden even more. Even when I had some challenging requests which didn't have obvious solutions, she calmly listened and committed to figuring the problems out, which, of course, she did. On top of knowing her stuff, she's just a pleasure--super friendly, responsive, calm--even in the midst of her busy season or figuring out a challenging problem. I've also been working with one of her employees, Judy, and she's also been a pleasure thus far. I can't recommend Yield Bookkeeping highly enough--they're a class act, know their stuff, and couldn't be more professional." "Yield helped me get last year's books done in record time so I could prepare my taxes on time. No whining, fuss or hassle. Excellent service." "Yield Bookkeeping Services has helped save me save time and work on what really matters. Their relationships with competent tax lawyers and accountants makes me confident pushing through the coming tax season. I am happy with the cost of service too. Bookkeeping that does not break the budget. Looking forward to a long relationship." "Yield Bookkeeping is a full service company that sends out my invoices, records data into QuickBooks, and sends me a profit loss balance sheet every month. I've been working with Rochelle for about a year and a half, and she's been consistent and dependable. Rochelle is so knowledgeable, and she helps me to stay organized in QuickBooks. Also, she truly cares about the success of my business- She follows up, answers all my questions, and helps me with complex transactions. In addition to the basic bookkeeping services that Yield provides, they also helped me set up credit card services. I'm extremely lucky to have Rochelle as a part of my team!" "Yield Bookkeeping Services delivers top quality customer service on time, every time. In addition to being accurate and efficient, Rochelle is responsive and engaged. When I have a question, she responds quickly, which is great, but she always knows my situation - she doesn't spend 15 minutes trying to find her place in Quickbooks and figure out what I'm asking about. She's either always well prepared or just really, really good - either way, I like it! 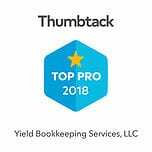 Yes, I was impressed with Yield Bookkeeping even after the first month or two, and I could have given a 5 star review back then. I have worked with Rochelle for over 6 months, including one 'end of year' and one tax season - smoothest year-end and tax time ever. Yield Bookkeeping Services works hard and deserves my 5 Stars!" "Rochelle has taken on an increasingly sizable and important role at our company. She initially only managed the books, but that went so seamlessly that we handed over the majority of our day-to-day accounting activities to her. We trust her and I highly recommend her services." "Before hiring Yield, we were spending so much time on financial and operational tasks. Yield has helped me focus my time on strategy and operations of running and growing my business, instead of getting bogged down in things that are not of my expertise - not to mention the cost savings from mistakes in invoicing, billing and payroll problems. The staff is always extremely responsive, trustworthy and listen to me enough to gain a keen understanding of the nature of my business. I recommend Yield Bookkeeping to any business that wants to grow and improve profitability and compliance." "FCRS has been utilizing Rochelle’s Bookkeeping services for almost two years now. We’ve been extremely pleased with her knowledge, attention to detail and her ability to quickly master our Chart of Accounts. Rochelle customized her services around our needs and has saved us time, money, and is always there when we need her." "I have referred clients to Rochelle for five years and have gotten rave reviews and appreciative comments back from many of them. Yield Bookkeeping gives excellent service at very reasonable prices. Rochelle truly knows her stuff." "Our firm has been working with Yield for over two years. As a small business, we wanted someone to basically take the entire responsibility of our bookkeeping needs. Yield took over from day one, working along the side of our team as if they were part of the company. It has been a very rewarding experience and as a small business owner, I especially was very impressed with the level of ownership and dedication they show for the work they do. Basically, I have been having a peace of mind knowing that my bookkeeping was in great hands." "After many years of managing our bookkeeping and billing with a dedicated in-house bookkeeper we were faced with change in that position. By working with Yield we developed a new system for our staff with their help. The transition has been fantastic and has not only made us more efficient but more accurate than ever before! Dealing with Yield has given me peace of mind with our books!" "You read these good reviews online and you think well that could just be fluff or their cousin writing it, but wow you guys really live up to the name."